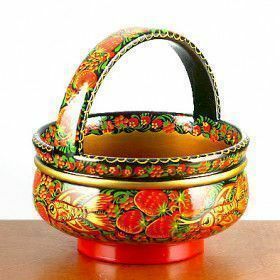 Khokhloma is a highly recognizable Russian handicraft. 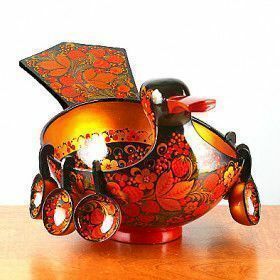 It is unique in history, technological methods and art style with a barrage of berries, swirls of golden leaves and an assortment of birds. 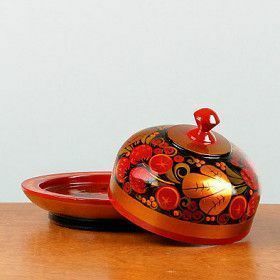 The popularity of khokhloma can only be rivaled by the Nesting Doll (or Matryoshka Doll). 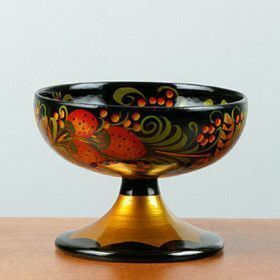 The history of khokhloma wood painting refers to Kovernino village in Nizhny Novgorod region to be its birthplace in the 17th century. The word khokhloma came from the name of a settlement that was a trade center for the local craftsmen. At that time, the Russian Orthodox Church Patriarch Nikon introduced ritual reforms that prompted a great division among the believers. The so called Old Believers had to flee from the persecution of the official church and found their refuge in villages hidden in the woods the banks of the Volga. Some of them knew the ancient iconography secrets and were willing to share them with the local people. The locals were known for their skills in producing handmade wooden tableware. There is also a legend being told about an icon painter Andrey Loskut, who lived deep in the forests and belonged to the persecuted group of Old Believers. He learned of a group of soldiers who were coming to forcefully bring him back to Moscow to answer for his dissension. They say he gave away his brushes, shared the Khokhloma art secrets with the villagers and burned down his house. He was killed in the blaze and no one who watched the red fire casting a golden aura against the black night sky would soon forget the colors associated with Khokhloma, the combination of black, red and gold. The colors, art styles and the production peculiarities make Khokhloma look so vividly and distinctly Russian. Red color is believed to be the color of beauty in Russian culture (Red Square in Moscow literally means "beautiful"). Golden alludes to wealth and black is viewed to be the color of the Earth. But back in the 17th and 18th centuries Khokhloma colors had a profound religious symbolism with black representing the cleansing suffering of the human soul and golden standing for the heavenly light. The skillfully painted wooden items were used as sacred church vessels and icon decorations in Russian Orthodox monasteries and nunneries. The tin powder used in the production process was an expensive material and only wealthy customers could afford to buy Khokhloma tableware. There are two main painting techniques: superficial and background. The first one uses red and black over the golden and the latter puts golden ornaments over the colored background. Khokhloma painters have always been inspired with the beauty of the nature and even nowadays they would bring fresh flowers to the workshops for quest of new ideas and themes. The craft motifs are primarily floral with golden exquisitely curled leaves, flowers and grass, scarlet berries. The process of creating a Khokhloma piece is time consuming and starts with the wood preparation. The linden or lime tree is being used for the craft. It takes about three years for the wood to dry in the specially equipped warehouses. After the wood is prepared, cut and carved into the desired shape, a thin layer of brown clay is applied by hand and the item is heated in a furnace. Next it is covered with three or four coats of synthetic oil (the linseed oil was used in the past) which is left to air dry. 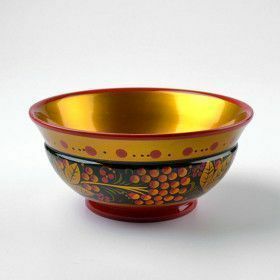 The distinctive gold color which is the trademark of Khokhloma pieces originally starts out as powdered aluminum (powdered tin in the past) and after being decorated with heat resistant paint and covered with lacquer is heated again in the electric kiln. The extreme temperature turns everything that was silver colored into golden as well as makes a piece durable and resistant to water, acids and heat. The Russian saying states that Khokhloma wouldn’t burn in fire nor would it drown in water. Khokhloma&apos;s popularity is constantly growing in the whole world. The famous design can be seen on the tails of some British Airways Boeing 757s, on the sides of the Lada Kalina Super 1600, and even on t-shirts. Khokhloma designs are all around us. You might wonder if you can use Khokhloma dishes and tableware in real life. In fact, you can! The paint is completely natural and doesn’t contain any harmful substances. 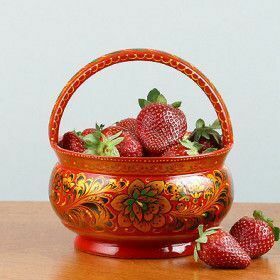 So you can eat from Khokhloma plates and bowls, use wooden spoons, put fruit or vegetables on the trays etc. 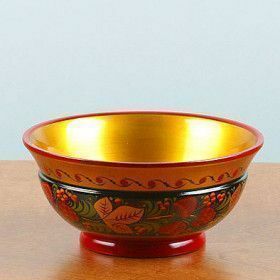 And if you take good care of your Khokhloma dishes, the paint will never fade. Following these simple recommendations, you will enjoy your Khokhloma masterpieces for many years.